Southern Vermont College received a B.
Washington Monthly's ranking of 252 out of 346 of Baccalaureate Colleges - Overall Rank was a major contributor to this grade. Tiny Southern Vermont College, located in Bennington, about 45 miles from Albany, NY, is a private college of the liberal arts and sciences that enrolls about 500 students. 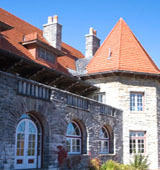 The scenic campus includes darned pretty 14th century English manor-style buildings. What is a typical Southern Vermont College student like? Describe the type of person that should attend Southern Vermont College. Students that attend SVC like small classes, we like nature and the beautiful view of the mountains, and we are willing to live in weather below 0 degrees Fahrenheit. What are the top 3 reasons someone should attend Southern Vermont College? If we have your major, if you want to escape the city or stay in the country, if you want to meet interesting people. What was a typical Southern Vermont College student like in high school? Describe the type of person that should attend Southern Vermont College. The typical Southern Vermont College student was driven in high school. People that care about their educations and enjoy small, quaint campuses should attend Southern Vermont College. Southern Vermont College offers a transformative living and learning experience that cultivates lifelong learners in a personalized setting, emphasizes active learning and exploration, and encourages empowered citizenship and environmental sensibility. Southern Vermont College is accredited by the New England Association of Schools and Colleges. SVC is a member of the Association of Vermont Independent Colleges. What are the top 3 things that students do for fun at Southern Vermont College? Students at Southern Vermont College like to do things like hike, play sports, listen and dance to music. The average student pays $22,959 for tuition, fees, and other expenses, after grants and scholarships. Total stated tuition is $21,725, in-state and on-campus, before financial aid. Learn more about financial aid at http://www.svc.edu/financialaid. Estimate the net price for you at http://www.svc.edu/admission. Southern Vermont College participates in the NCAA Division III for college athletics. Want more info about Southern Vermont College? Get free advice from education experts and Noodle community members.